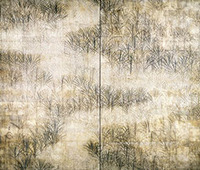 A painter and printmaker, Jakuchu was born and worked in Kyoto. The son of a rich grocer, he lived in the Nishiki quarter near the markets. Jakuchu was financially free and able to devote his whole life to painting. He specialized in painting elegant barnyard fowl--keeping many exotic birds in his garden--but also produced Buddhist subjects.